When it comes to finding the best kids bedding for your little ones, comfort and color are key. You want to create a space they can call their own, but one that perhaps doesn't stray too far from the aesthetics and design of the rest of your home. Whether that means subtle patterns or letting the kids go wild to match your home's eclectic style, there are a lot of places to choose from when shopping online for kids bedding. From basics like solid sheet sets and duvet covers to playful...MORE throw pillows and designs featuring your kids' favorite characters (Harry Potter, anyone? ), the options are better than ever, now. Even Pottery Barn Kids has a collaboration with Disney! Ahead, we've rounded up ten of the best places to shop online for your kids' bedding, from big department stores with huge selections and brands you know, to specialty shops with unique offerings and fresh discoveries you and your kids will love. No surprise here, but Target is a great resource for kids bedding when you don't want to spend a fortune. If you're looking for cool and understated, they've got it. If you're looking for cute and themed, they have collections for that, too! Throw pillows shaped like foxes, tents that make a bed feel like a fort and bedding covered in their favorite characters are all available. Their in-house brand Pillowfort is one of our favorite collections for bedding—it is the perfect blend of childhood whimsy and works-for-the-whole-house style. Sure, Pottery Barn kids will have all the classic, crisp children's bedding you'd expect from the brand, but what we especially love for kids are their sheet sets featuring beautiful (subtle!) illustrations from some of their favorite books and movies like Harry Potter and Frozen. Crate & Kids—the shop-in-shop for children from Crate & Barrel—has bedtime covered with their extensive selection of kids bedding. 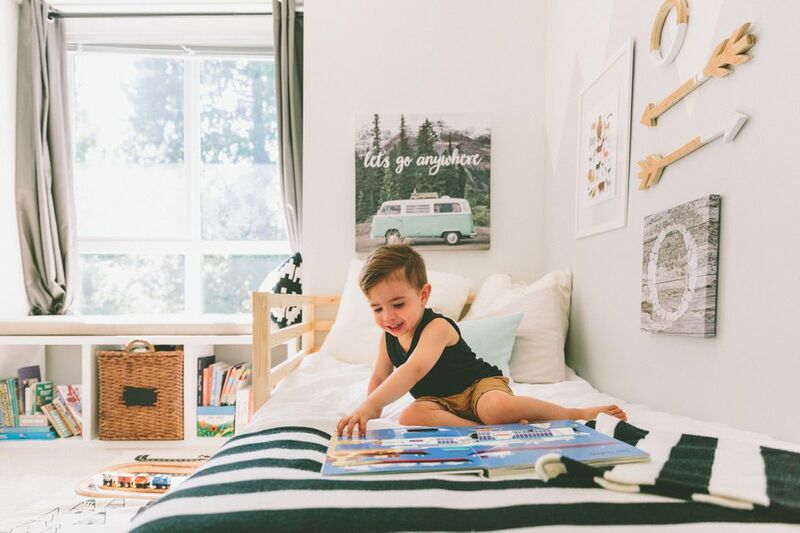 From sheets and duvet inserts to quilts and blankets, you'll find playful prints and easy to mix-and-match solids that can grow with your little ones. From stars and dinosaurs to trucks and mermaids and all kinds of nautical creatures—these bedding sets will inspire sweet dreams, no question. Dogs and llamas and elephants, oh my! Our favorite sheet sets and bedding from The Company Store's offering of kids bedding has to be their adorable animal prints. We love any decor and bedding that promises high-quality and brings the fun, which you'll get with The Company Store's percale bedding for kids. Is it wrong that we'd totally use West Elm's selection of modern kids bedding in our own, adult rooms? If it is, we don't want to be right! West Elm offers an array of sheet sets, duvet covers and quilts that can serve as a sophisticated, welcoming canvas for your kids rooms' more whimsical and playful stuff like toys and artwork. We also love that these bedding sets will grow with your kids, extending the life of your purchase. Bed Bath & Beyond is a great source for brands you know like DKNY, Marvel, Minions and even Pendleton. (Yes, they have a kids collection!) We love how easy it is to narrow down your search on BB&B's website by brand, life stage and size, of course. They also offer free shipping on orders over $39, along with having frequent sales and coupon offerings. Along with having all kinds of necessities for baby, Modern Nursery offers a fun selection of bedding for toddlers and kids, too. Some of the styling on their website is a little over the top—we don't think you need to match your curtains, rug and bedding all in the same print—but you can mix and match to create the look you're after in your kids' room. Because of their frequent sales and amazing deals, we always recommend checking out Macy's when shopping for home goods and bedding. You'll often find popular brands like Ink+Ivy, Marvel, Disney and Star Wars marked down to killer prices. They offer a good mix of super-youthful and playful character bedding from movies as well as more classic, grow-with-them colors and patterns. Along with a really nice selection of soft and sophisticated kids bedding options (they're known for their flannel), Garnett Hill has something we haven't seen from other online retailers: sheets with glow-in-the-dark designs! Yes! The flannel sheet set, duvet cover and pillow cases all feature cute illustrated rocket ships that glow when the lights go out. How cool is that!? We know, we know—you can find literally anything on Amazon these days. So if you're looking for a bit of a one-stop shop for outfitting your kids' room and bed, it's a great option. With Prime, you can even have your purchases in just two days. They have tons of character-based bedding your kids will love from movies and TV shows they're obsessed with like Moana, Cars, and Super Mario Brothers. Plus a huge selection of more timeless designs from brands like Urban Habitat, Highbuy, and Sweet Jojo.